Yesterday we were hanging around the mall, waiting to meet up with a friend who was arriving at the adjoining train station. We ducked into a shop that sells grooming products as Spectrummy Daddy needed something for his shave. While in there, I saw some expensive-looking face masks. Normally I wouldn’t consider spending so much, but my skin was very dry after a cold, and could have probably used a little extra moisture. Before I had a chance to pick it up, a sales assistant pounced on me. Is it, really? I’m no stranger to this type of a pitch- they do it all over the world. In a hair salon, the stylist will tell me they love the thickness of my hair, then proceed to tell me the colour is drab and I need highlights. Or my natural colour is gorgeous- and no grey!- but it is in terrible condition and I need to buy their special treatment. Only, I don’t. I choose to cut my own hair at home instead- it isn’t like I have the time to spend in a salon anyway. And yes, within minutes, the lady is applying a gel that costs R800 to “even out my skin tone”. That isn’t enough, and she moves on to the dark circles under my eyes. She is talking anti-oxidants and free radicals. The benefits of rooibos (but not drinking it!) and how I shouldn’t put chemicals on my skin as it ages. My skin is stinging and shining as this special formula only available in London or Paris (wait, where am I?) seeps into my pores. Which are too large, there is another product for that. So I’m not really listening, I’m just waiting for her to stop so I can get out of there and wipe the stuff off. I should be vulnerable to this. My feelings should be smarting just as much as my epidermis. I should be reflecting that I’m about to turn another year older- no spring chicken any more. I should be thinking that the last time I saw my friend was in Luxembourg, when Pudding was five days old and we were just out of hospital. I remember my friend saying I looked great- you couldn’t tell I’d just had a baby, and I mumbled something in return about being sleep-deprived. Hah! Pudding slept better as a newborn than she has in the six subsequent years! If I thought I was tired then, what am I now? If I didn’t feel my skin looked fresh then, in my twenties, how does that compare to now?. I just really don’t care, and it is truly liberating! Maybe my skin is a little dry. Maybe my hair could use a trim. But really I’m okay with how I am. With who I am. It has taken 35 years on this planet to get really comfortable in my own skin. No sale for this lady- I don’t even bother with the face mask I would have bought had she not told me how ugly I am! Instead we head to the bathrooms and wipe the gunk off my face. We head outside and I embrace my friend, and we marvel at how long it has been…at how much has happened since we last met. Does it show in my face? Maybe…but I wouldn’t change a thing! Once upon a time I needed a cosmetic fix. These days I realize I was never broken. That might be the best birthday present I’ve ever given myself. cosmetics, superficial measures to make something appear better, more attractive, or more impressive. Spectrummy Daddy and I went out on a date on Friday night to celebrate our anniversary. We get out together every 2-3 months, which is seldom by anyone’s reckoning. Our plan was to get the children to sleep and then I would collect my friend B, who was babysitting. I’m convinced the kids knew we had plans to ditch them, because they took even longer than usual to get to sleep. By the time I got Cubby down, it was already half an hour later than when I said I’d pick up B. I hadn’t tidied the house, changed clothes, or done my hair and make up. I left Spectrummy Daddy to tidy the house while I tidied myself up, as best I could in less than 5 minutes. I got dressed, very quickly applied foundation, powder, blusher and mascara when I came to an abrupt halt. No lipstick. I no longer owned a single lipstick, or lip gloss. In the five years that I have been married, and (for the most part) not employed, I’ve seen no reason to buy make-up. The make-up I owned before getting married has lasted me until now. I know, you’re supposed to get new stuff every few months or so, but it always seemed like such an unnecessary luxury on one salary. As I don’t wear make-up on a day-to-day basis, Pudding doesn’t really know about cosmetics, which I’m okay with. I don’t want her to be insecure about her appearance. I want her to know that pretty is meaningless, and she is truly beautiful, inside and out. On the odd occasion that she has seen me dressed up and wearing make-up, I get a “pretty mummy” compliment from her, but she doesn’t know the artifice involved in my appearance. This does not mean she has no interest in make-up. Presumably to her it just looks like art supplies, and Pudding is an artist. 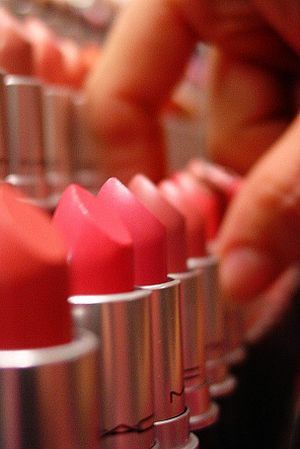 Lipstick is particularly appealing with the colours, twisting mechanism, or little dabbers and brushes. So over the last few years, every single one of my remaining lipsticks has been smeared onto walls, clothes, and carpets, until finally on Friday night I discovered there was no more. All evening, I just didn’t feel right. My appearance was off, and it made me uncomfortable. Suddenly my clothes felt tight, and I felt all the weight of a stone (14 pounds) heavier than I was when I got married. I know how vain that sounds, but I don’t think of myself as a particularly vain woman. These days I cut my own hair, and I don’t go for facials, massages, manicures and pedicures, like my friends. I can’t seem to figure out how to devote enough time to myself, when I already feel that the kids don’t get enough of me. Last week I showed Pudding my wedding photos. I asked her who she saw, and she said, “Daddy.” I asked her if the lady was Mummy, and she replied, “no, that’s not mummy. That’s pretty mummy.” It made me smile, but there is a difference between the woman in those photos and the one I am now. Not just a difference in beauty, but a difference in self-esteem. That woman knew how to take care of herself. This one is too busy taking care of everyone else. That woman was fit, relaxed and energetic. This one is dull, tired and worn out. Once in a while, I miss the old me. On Saturday we went to the mall, and I visited Sephora, which has been my place of worship since I lived in Paris. I bought products for my lips, cheeks, eyes, and skin. I even bought new products I’m going to have to google to find out how to use properly. Apparently five years is a really long time in the cosmetic world, things have changed. For the quarter of an hour or so in there I concentrated solely on me. It took me back to lunchtimes on Oxford Street picking a new eye-shadow to go out that night. It felt really, really good. And anyone who says you can’t buy self-esteem has never seen me spend $75.60 and fifteen hedonistic minutes in Sephora. I do realize though, that these are nothing more than “superficial measures to make something appear better, more attractive, or more impressive.” I know that I have to get some time for myself, exercise, and find some way to get the kids sleeping well so that we can too. But until then, I can put my mask on, and feel good about myself. Because a cosmetic fix will work, for now.